Moorland is unenclosed land, usually of low fertility and at a higher altitude than its surroundings. The term is used of areas in temperate climates, and the typical vegetation is of grasses, heather, cowberries and similar plants, with very few trees. The soil is often peaty. Moorland is sparsely inhabited. 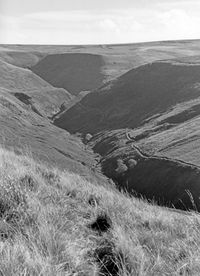 In some novels, such as Stevenson's Kidnapped, moorland is just a difficult region to be passed through, but in others it is endowed with a strong personality of its own. In Wuthering Heights by Emily Bronte, the Yorkshire Moors and particularly their weather provide an essential background to the development of the story. Lorna Doone by R.D. Blackmore is set in the wilds of Exmoor. In Hardy's novel The Return of the Native, Egdon Heath is virtually one of the characters, killing one person and strongly influencing the behaviour of others. Hardy's descriptions of this fictional landscape, which he explained was a composite, are among the classic descriptions of literature and inspired Gustav Holst to his finest music. The Hound of the Baskervilles by Conan Doyle uses descriptions of Dartmoor to establish the atmosphere of the novel. This page was last modified 19:35, 11 October 2015.